Residential - Twin Oaks Refrigeration, Heating and Cooling, Inc.
Should I repair or replace my system? Consider asking yourself a few basic questions. Am I operating an efficient system? 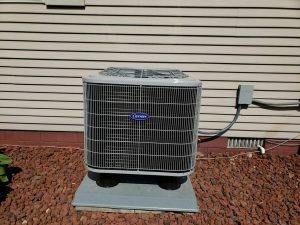 Consider , a 13 SEER air conditioner or heat pump will save you money on your electric bill and your savings will be determined by the SEER rating, efficiency of your current system, are you getting the most for your money? For example; a 13 SEER can amount to a savings of about 28%, compared to a 10 SEER. Just think, you could possibly save up to 60% on your energy bills with a new, high efficiency system. In a short period of time, your new high efficiency system could actually pay for itself. My system is only a few years old; is it worth it to replace? Your current system may be enormously inefficient by today’s energy efficient standards. History illustrates the energy efficiency of an air conditioning system. In 1992, the typical SEER rating of units made were about 6.0. During 1992, the government established the minimum cooling efficiency standard for units installed, in new homes, at 10.0 SEER. All manufactured equipment on or after January 23, 2006, has a minimum efficiency standard of 13 SEER set and mandated, by the U.S. Department of Energy. Does this mean I need to replace the coil too? The minimum standard set by the government addresses the entire air conditioning or heat pump system, not a portion of the system. The equipment must match in order to save energy and money. Does my system break down often, and are the chances good, it will break down again? If you answered yes, this will mean an extra added expense for an emergency call or even worse, possible damage to the other components of your heating and cooling system. Now ask yourself how long have I been experiencing this unexpected, extra “out-of-pocket” cost that I may have been able to avoid? Contact the experts at Twin Oaks and begin to rid yourself of unwanted expenses and source of worry. Along with the savings, start enjoying your new “Indoor Comfort System” today. We offer a wide range of quality, certified efficient and quiet running air conditioners, furnaces and heat pumps that will help make your indoor environment comfortable. Contact us for details and a free indoor air quality evaluation of your home. system for your home is, one of the more important decisions you will make as a homeowner. You can depend on our comfort systems and services to provide you with the level of comfort you need during those cold winter months and hot humid summers. Twin Oaks’ commitment to you is, ensuring that the trust and confidence you placed in our company, to provide, the finest quality products and services bring you “Peace of Mind” for many years to come. Take comfort in knowing Twin Oaks is the most dependable, reliable company, providing home comfort. The extensive “hands-on” experience with all makes and models, is what makes us second to none. You will have the confidence and security in knowing your family’s comfort and safety is in excellent hands. Twin Oaks will be there from the beginning of your project designing, the ideal system for your comfort needs. From computer designed models to location of diffusers and equipment selection, you will work together with one of our comfort advisor’s choosing from our “Total Indoor Comfort” and “Indoor Air Quality” products that will bring you and your loved ones long-lasting comfort. Whether you choose from a standard, two stage, variable speed, high efficiency, furnace or a standard (13 SEER), high efficiency, air conditioner (quiet operation), heat pump, zone control, humidifier, media air cleaner, to high efficiency electronic air cleaner, you can depend on only premium quality products in the industry are being offered to you.